Three bedroom and three bathroom luxury condo located in beautiful North Mission Beach with great amenities. 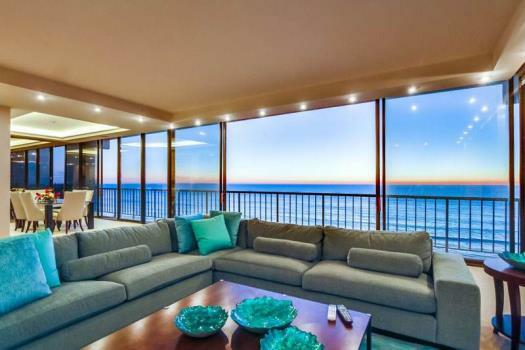 This spacious, ocean front home boasts gorgeous ocean and bay views. Sophisticated in design, this upper level home is approximately 1,400 square feet and includes a private upstairs balcony from the living room overlooking the ocean. There is also a private rooftop deck with a hot tub, BBQ, outside shower and views of the bay. The master bedroom has a California King bed as well as sliding glass doors out to the balcony, overlooking the ocean. The other two bedrooms include a Queen Bed and Double Bunk Bed. Each bedroom features flat screen TVs with cable and luxury linens. The living room includes a fireplace and gorgeous ocean views. 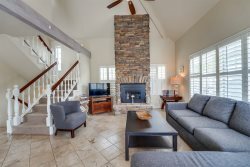 This home has all of your modern conveniences, including a dishwasher, microwave, internet access, and washer/dryer. Parking: 1 car and 1 outside space (compact). The outside space is 7'-5" x 28'-0". The garage is 8'-7" x 20'-9". Our flight was delayed by 12 hours, so Penny Realty had no problem allowing anoth memeber of our party to check in in my behalf. The ENTIRE rental process was simple. This property was PERFECT. We had a great time during our 4 night stay and I certainly hope to rent this property once agin in the near future. Jeff was awesome from the Very first phone call I made from New York! He was incredibly helpful With the two different problems that we had During vacation. The receptionist was awesome as well. She gave us some great ideas of what to do while we were in the area.I definitely will work through Penny Realty again. Decked Out was a beautiful piece of property! It was spacious, and the part of Mission Beach that the house is located on his tranquil and Beautiful. The inside of the house is gorgeous, a little bit of TLC needs to be put into the property. Our stay was incredible and we are very pleased we chose this residence.